Little App helps you save money through awesome deals on everything near you! Restaurants, last minute hotels, movies, spas, salons, weekend activities, sports activities, adventure activities, health & fitness activities - you name it and Little has the best deals & discounts on it. Little App Giving 100 % Cashback on Purchase (Maximum 300 Rs). 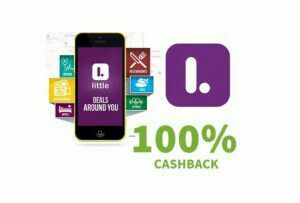 How to Get 100% Cashback from Little?